I use ² and ³ a lot in e-mails. When using my Belgian Windows keyboard and a custom keymap it was easy to type this in Mac OS X as I assigned the appropriate key. Now I switched to a qwerty International English Apple keyboard and I'm unable to type these characters easily. I've to copy-paste them or select them and make them superscript. Is there a way to easily type these characters with touching my mouse or need to copy-paste? There are some important gotchas with the other solutions posted here. 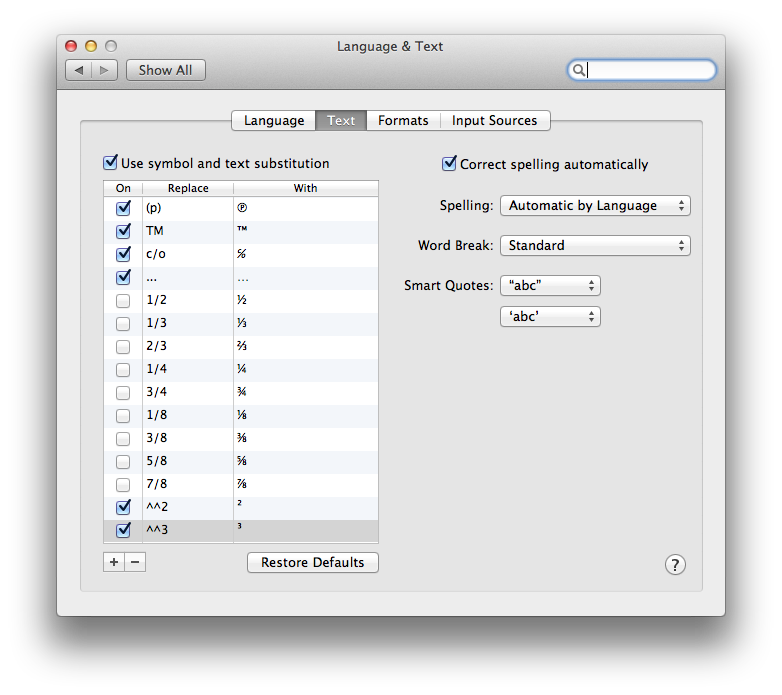 If you can enter the ² and ³ once, you can put it in as a substitution in System Preferences, Language & Text -> Text. Put something unique on the left side, like ^^2, then paste your symbol in on the right. This is from Macworld, but the Macworld article assumes Lion would make this step unnecessary. It didn't. Maybe Mountain Lion will. As for entering the ² and ³ into System Preferences: You can use the character palette or paste to enter the symbol into the right side. It sounds like you already have this part figured out, though. Then type number you want then repeat above shortcut to return script size to normal. can be used to remap keys in OSX and is compatible with Lion. I've used it to remap the volume buttons only. You should be able to figure out your solution using this tool. You can use the Character maps on a Mac or install a 3th party software like PopChar. Highlight the digit you wish to shrink and elevate. Press cmd+- to resize. In format under the 'font' heading, click the 'settings' icon on the row with bold, italic and underline to find advanced settings. Select the baseline shift option to elevate the digit. A bit clunky, but if you don't need it often it's a simple option. I do something similar with Typinator (card suit symbols), which is from the same company as PopChar. I think there are competitors that do the same thing. I don't treat the symbols as superscripts. I looked up the Unicode characters for them (superscript numbers are also separate Unicode code points). Every font I use has these glyphs; of course, your mileage may vary. Not the answer you're looking for? Browse other questions tagged keyboard character character-map . How can I re-run the initial Setup Assistant on Mountain Lion? How can I use text substitutions without having to type a space? How to use Aquamacs on a non US keyboard?